Wednesday has arrived and tomorrow is Layla’s gotcha day. I cannot believe she has been with me for 8 years WOW, it seems like yesterday she arrived a matted mess from the shelter. I am not sure how many of you know her story, but she was one of the unlucky ones to be dumped by her family at the age of about 6 for the same reason everyone else dumps their pets, no time. I saw her online sitting in the shelter, the photo said it all, my friend rescued her and another brought her to me and the rest is history. Layla has come a long way from being a scared shy dog and I am blessed daily to have her in my life. This is one of the reasons I think I am so paranoid when she does not feel well whether upset tummy, allergies or anything else and I am doing my utmost to keep her as healthy as possible. She has always hopped with her left back leg up and the vets have never worried about it, but with aging I have become more concerned so have been doing research on different products which will make sure she is not in pain or uncomfortable. Through my research I came across this company, Restorative Botanicals that make Hemp products specifically for pets plus humans and contacted them as their products sounded exactly what I was looking for for Layla. They were kind enough to send me their 4 Paws Hemp Oil Extract which supports Weary Muscles and Joints, Calming Disposition and Overall Health. It is made with Certified Colorado hemp, cod liver oil and cold pressed organic, virgin hemp seed oil, in a well balanced nutritional blend designed to keep your companion feeling calm, healthy and comfortable. Since I have been using it on Layla I have noticed her to be calmer, especially with me starting a new job and not home in the afternoons, when she walks she is not hopping as much unless she starts running which is not that often. It is something I have been looking for and so happy I found. Another product I received from them and I am so happy with this is their 4Paws PET Hemp Extract Topical Relief Balm. 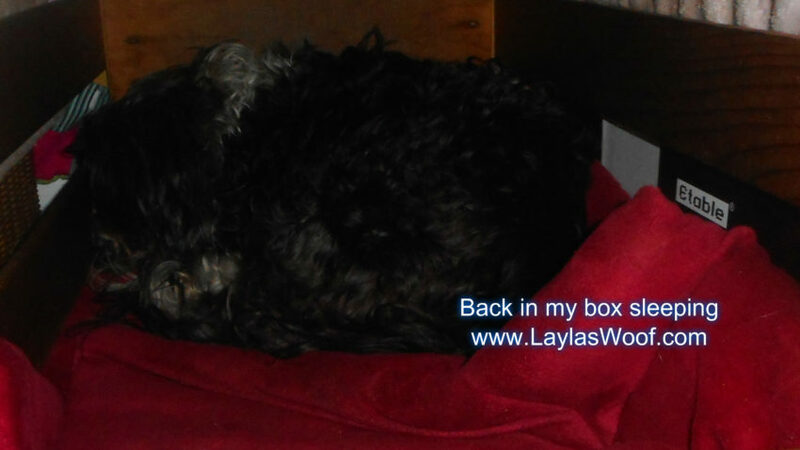 As you all know Layla suffers from allergies and then of course it causes hot spots. I am so against all the topical sprays so when I saw this I thought to myself WOW, perfect for her. You all know from my last blog we went to the beach about 10 days ago and Madam has been scratching since. Between that and the warm weather last week and park, Missy started a little hot spot and I immediately rubbed the balm on her. It worked wonders, she stopped chewing on herself, calmed down and I found that within one day the hot spot was nearly healed. It was so great to see that and not have to worry about her getting an upset tummy from licking it, as the Hemp Extract Topical Relief Balm is safe and relaxes her, in a nutshell a must in a persons first aid box. The company also surprised me with a gift of Muscle & Joint Cream which I have been using on my ankle and feeling so much better plus a bottle of Spice Flavor Restore Calm Hemp Oil Supplement which is really helping me to stay calm. I want to say thanks to them for making our lives calmer and mine more relaxed for sponsoring us with these products. The difference I have found with Layla when it comes to CBD oil or Whole Plant Hemp Oil, I am more and more preferring the Whole Plant Hemp oil as I am finding she is calm but not sleepy, eating better and much more herself. I personally think in the future I will be using Whole Plant Hemp oil with her and not CBD oil. With the research I have also learnt the difference between Whole Plant Hemp Oil and CBD Oil and am happy to share here so we all understand it better. Within the hemp plant, there are numerous cannabinoids and other phytonutrients. A good full-spectrum hemp oil will include all of this material in the same proportion that occurs naturally in the plant – and that’s our belief – for maximum effectiveness, you need a full-spectrum, whole plant extract. Plus, when all of these materials work together in the body to support the endocannabinoid system, it’s known as the “entourage effect”. (Thank you Rick from Restorative Botanicals) for the explanation. “CBD” (CBD isolate) products contain only the CBD cannabinoid without all of the other beneficial materials – and therefore may not be as effective as the full spectrum whole plant extract. So the question now is what am I going to do for her gotcha day LOL. Madam is spoiled all year round so decided for her birthday am going to get her her favorite for dinner, chicken livers and gizzards mixed with chicken, she will be in heaven from that. Thank goodness the week of rain is over and we are having some sunshine as it is needed to dry off everything including us LOL. We had a great busy weekend as usual and the weather being good even made it better especially as I had Monday off, nothing like a long weekend to pamper Layla with quality time. On Saturday we went to the Women’s March where Layla became little woman LOL. There were a lot of people plus many dogs which I was surprised to see. 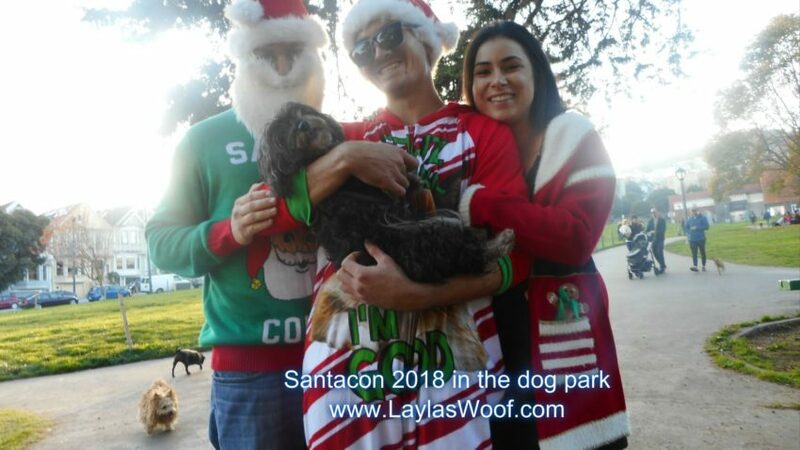 It was wonderful to be there and although we did not March as Layla was not happy with all the noise and I had given her some CBD oil before we left, I decided to come home when they started. Yes she was in the backpack but so antsy I was getting back ache from her moving around. So we took the bus home and got off in the park and relaxed there for a bit. It was a great day in all. On Sunday we just chilled, relaxed and did nothing but normal walks in the nice weather, perfect for me to recharge my batteries and for her to get some exercise. Monday we had a big adventure, a friend of mine with his two dogs decided to go down to Chrissy Field which is a great dog area on the beach so off we went. 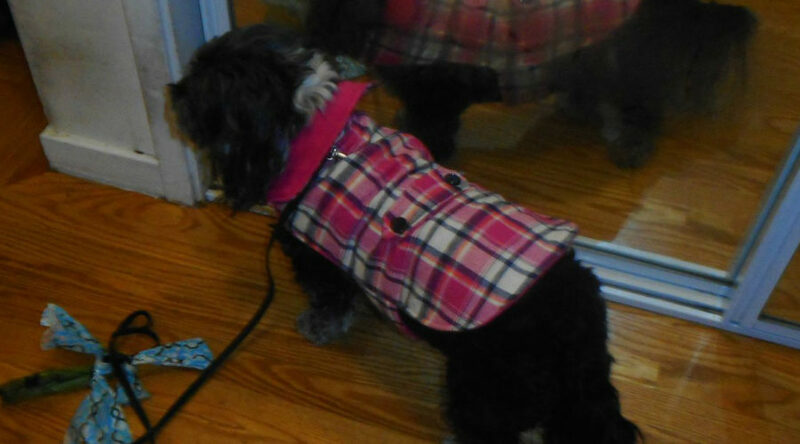 Layla was happy trotting along as long as her paws did not get wet LOL. It was so nice sitting on a blanket on the beach, looking out at the sea and Golden Gate bridge, drinking coffee and chatting. A perfect day in so many ways. Layla was happy although came home sandy and itchy poor thing but I immediately rinsed her off with some warm water and apple cider vinegar just in case there were any bugs LOL and then she ate and went to sleep. I cannot believe that 8 years ago Layla was dumped at the shelter and how far we have come together, from her fear of people to a lap dancer today and so much more. So that was our weekend and now back to work, housework and all the mundane things while Madam chews on a bone and relaxes. 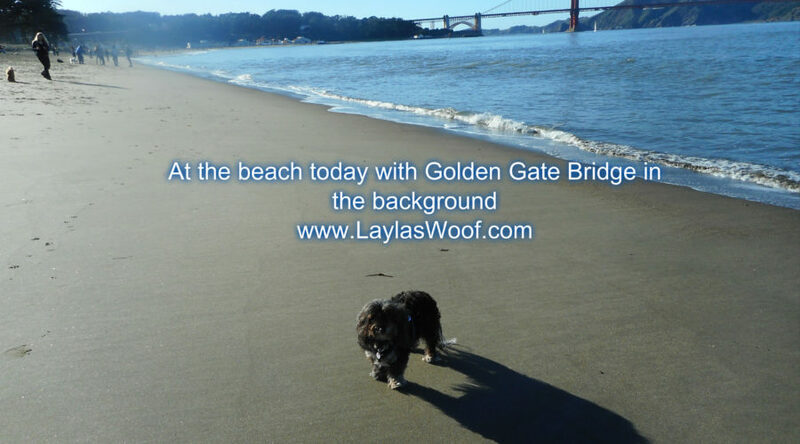 Life is good in the Layla Neighborhood. On this sunny message we are saying to everyone be safe in the cold weather, and those in the Southern Hemisphere stay cool as we have been reading about the heat waves and fires. Today we are expecting a major rain storm which means me getting wet but BOL Mom has to go to work so she will be swimming there while I sleep cozily in my bed. This is the life, Mom working, I have food, treats and a warm bed while she is out there suffering, I like that and call it Karma as she makes me walk in the rain. It will be soon my gotcha day and Mom and I were discussing how I was dumped in the shelter and how lucky I am today especially when she sees the amount of dogs that have been dumped, it breaks our heart and she told me she wish she could afford a brother or sister for me. I am not sure if I want one though as I love being the only child. Since I took Layla off the dog food and only cooking at home including her veggie smoothies I have noticed she has lost some weight. She was never over weight so this is worrying me a bit. I was talking to a friend of mine yesterday about it as he only cooks for his dogs and has a senior, a little older than Layla and he told me that the same thing happened to him and I must not worry. He did suggest I only use the brown meat of the chicken as it is fattier and add a little brown rice to her food for carbohydrates. So as I got a Power Cooker as a gift from friends I made up some brown meat chicken for her yesterday with a little brown rice and of course all the veggies. When I made the smoothie of the veggies, zucchini, carrots, spinach, parsley, peas and green beans, plus some apple and blueberries, I added the rice so she would not know she is eating it as she spits the rice out LOL. She ate all her food yesterday and today so I am hoping this will help solve that problem and if not her annual vet visit is next month so will ask the vet. She is not drinking more than normal which I am relieved about. I am finding it hard to find in some ways the perfect balance as I am always worried that I am doing something wrong so if anyone has any input am open to it. She is also getting a teaspoon of goats milk in her food, plus green lipped mussels and coconut oil. This past weekend was basically most of the time indoors because of the rain and next weekend I think it is going to be the same. 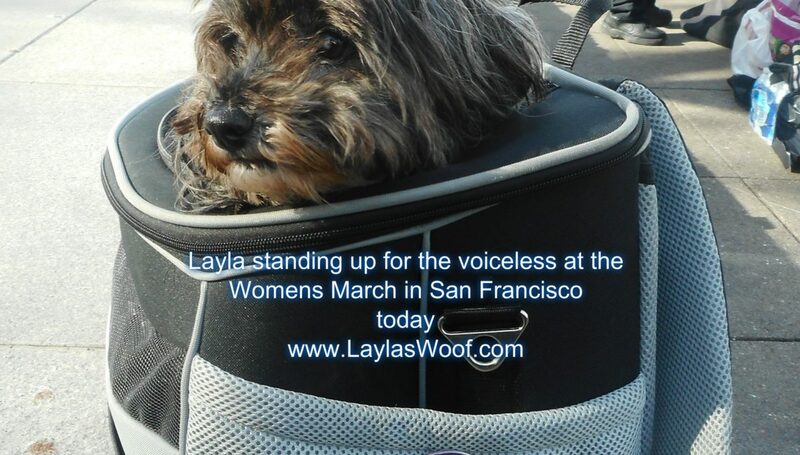 The Women’s March is on Saturday and I am debating whether to go or not, Layla in her backpack of course but will decide on Saturday when I see the weather forecast. So life has not been that exciting this past week thanks to the rain and I think we are going to be stuck inside till the weather changes. How are you and we hope you have all recovered from the holidays and over eating LOL, we have managed to relax in the middle also. 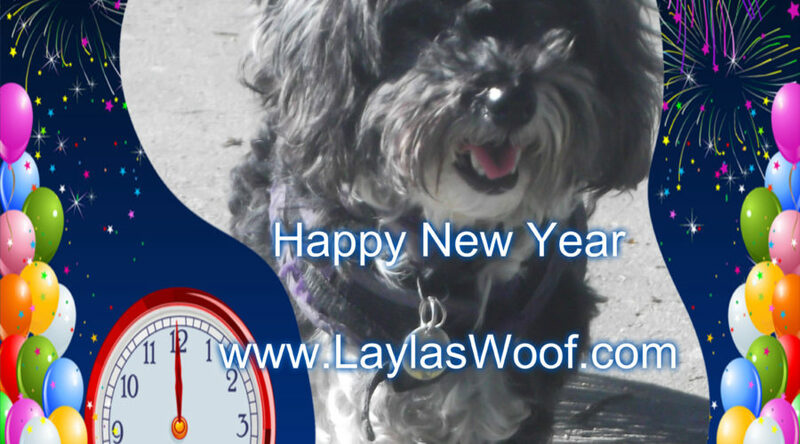 January is a special month for me as it is the month that I ran from Domestic Violence and found my freedom and it is the month that I rescued Layla also, we call it the month we found our freedom. It has been a long journey, there have been ups and downs like when I lost Baby but whatever the negatives have been I am so happy I did it, saved Baby RIP from the abuse and although life is not perfect today I would rather have this life than what I had. Rescuing Layla is a bonus, she has given me so much laughter, love and friendship which is things money cannot buy and I am so blessed to wake up to Ms Piss and Vinegar every morning. Today and the next couple of days are for Layla Christmas Tree heaven as everyone puts their trees out to be picked up so she when going for walks pees on all of them. I often wonder what is going through her mind when doing it as when we visit friends over Christmas we watch the dogs to make sure they do not pee and then overnight they have the freedom to do it whenever they want. They must really think we are nuts. Many are asking what resolutions we have made for New Year and going to be honest have made none, am going to take each day as it comes, cross every bridge as I get to it and make the best of the year as possible. Of course though the most important is keeping Layla healthy and happy. So as Layla starts her morning nap we both want to wish everyone again a Happy Healthy 2019. Christmas is over and New Years Eve is around the corner. 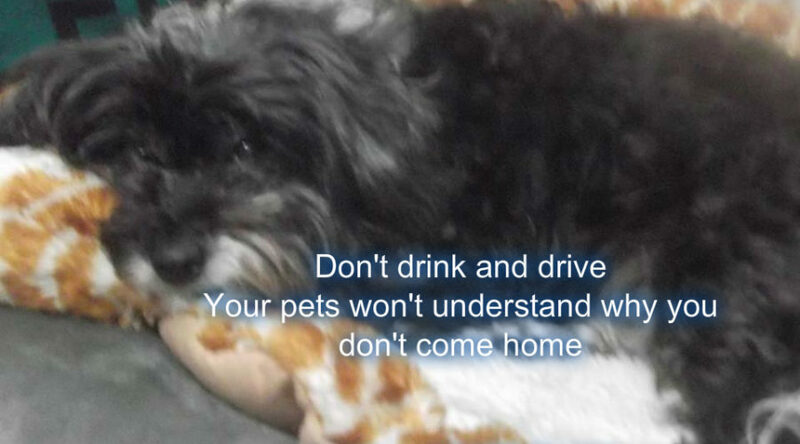 The pets nightmare as I call it as so many are afraid of the stupid fireworks and that means pets getting lost. I have spent the whole morning trying to update Layla’s microchip as I got a new phone and number and it is a nightmare. I contacted Avid as I thought that is where she was registered to be told she is not, LOL, the first thing I did when I got her I registered her. So I went digging in her files and emails from the day of her arrival, thank goodness I have a Layla file on gmail and found that she is registered to another company called PetChip I checked that company and all is good there with her profile etc but Avid is saying it is one of their microchips so she should be registered with them. So have emailed that company and now waiting for a reply from them with the update of the new number. This has totally confused me and have decided to leave it as is at this moment. Layla thank goodness is like velcro in the park and wears a PetHub.com tag on all her collars and harnesses where someone can scan with a phone and find me. New Years Eve, one of the nights I hate when everyone gets drunk and sets off fireworks everywhere that it is scary. My heart goes out to all the animals that are in shelters shivering already from fear, and then have to endure the fear of the fireworks with no one around to comfort them. I wish we could just empty those shelters and all animals would have loving homes. 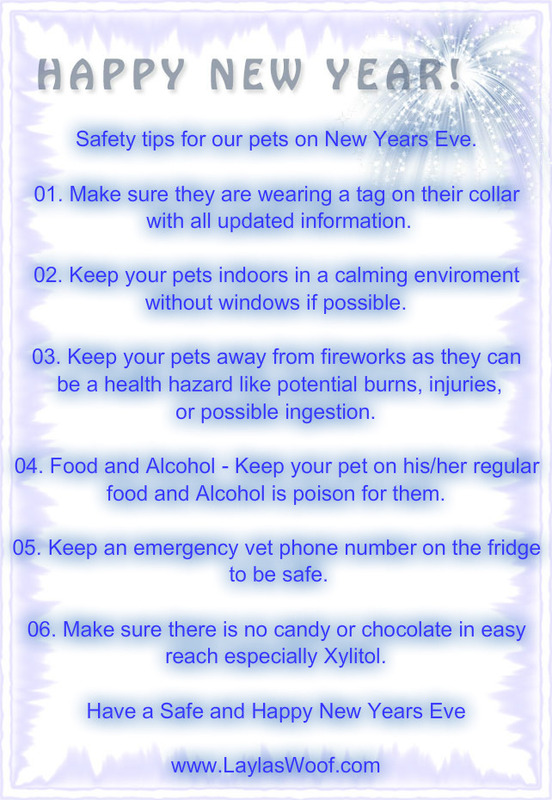 How do you keep your pet safe during the fireworks ? I as always puts Dr Bach Rescue Remedy in her water, a couple of drops of CBD oil on her tongue and from there just keep an eye on her. I do not take Layla out after like 8 in the evening unless she tells me she wants to go out. I make up her bed in the shower where she loves to go sleep, water is next to her, and a I also put a t-shirt on her which seems to help a lot. TV is going of course and that is how we spend our New Years Eve. I do not go out as I will not leave her alone. So on this note we want to wish everyone a Happy New Year, may 2019 be a good year for all of us with lots of love, laughter, health and happiness. How are you ? Are you getting excited for Christmas ? I am although Mom says I got all my gifts for Hanukkah so she is not sure if I will get something for Christmas. I call that unfair and discrimination BOL. What do you think ? We have been busy as always although it was raining I decided to stay indoors unless I had to do my business and watched Mom run around doing errands and getting wet. My new game is when I hear the leash I go hide in my box and refuse to move which makes Mom mad sometimes as she says she has no time for all my games like that as she has things to do. Too bad, I do not want my paws wet. I also made sure on the errand list was my favorite bones and warned her that if she did not come home with them I would bark at her. Guess what she listened to my orders so I am one happy girl here. 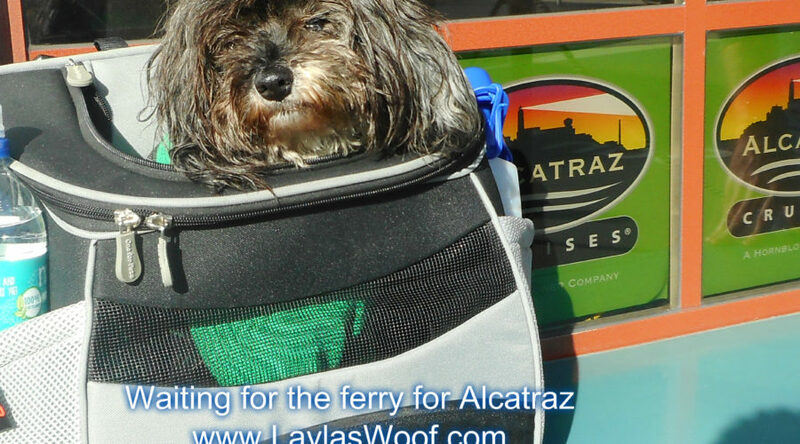 Yesterday, Tuesday, we went on an adventure to Pier 33 as we were planning to go to Alcatraz. The weather was great and warm although Mom, being Jewish bundled me up in a hoodie just in case. Grrrrr I hate clothing. This was an organized fun day out by PAWS (Pets Are Wonderful Support) and when we got there although they had been told that dogs could go, they said no when we wanted to board. There was another dog also who was turned away. So we just spent time wandering around the pier and then came home. It is very interesting as Federal places do not allow Assistance Dogs even with all the legal paperwork but service dogs yes. State Parks allow dogs, so a lesson was learned and as Mom said if Layla cannot go neither would she. So bang went the idea of seeing Alcatraz. Our plans for the coming days is Mom is working and I am just bossing her around when I want to go out or to the park and she has promised me as soon as the weather is nice again she will take me somewhere. I cannot wait as I love riding on the trams and smelling and seeing other places plus of course getting lots of pets from strangers. Best of all BOL of course is Mom carries me in the backpack part of the way, ohhhhhh I am a lady of luxury. As we mentioned in our last blog and reminding everyone again, this is a happy time for some but a miserable time for others. So many pets are being dumped at shelters and I am noticing more and more how many seniors which is even more upsetting. I have been staying up late at nights with others cross posting everywhere to try save as many as possible. I am slowly giving up on people and their cruelty. A pet is for life, not for how you feel, and I question all the time how many of them dump their senior family at different places as they are too lazy to be responsible and care for them. It just makes me sick. Mom also wants to add in memory of my sister which we do every year is the Christmas Tree in the dog park my sister used to go to. 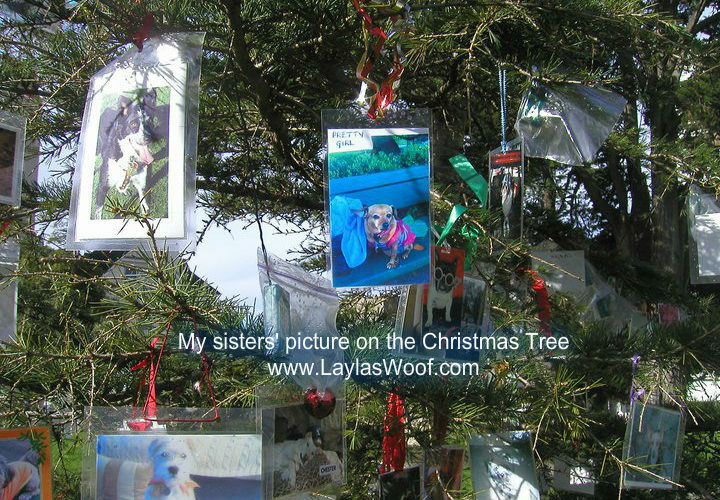 What they do is decorate one of the trees and put all the photos up of all the dogs, I think it a great idea and there are times like this that I wish I had had the opportunity to meet her. NOW before I forget I want to wish all my fur friends Happy Holidays, may you have a wonderful time with your families who you are blessed to have, and I cannot wait to hear what you found under the Christmas Tree. How are you all and we hope you are staying warm and toasty but at the same time I always think and worry about the poor pets that are left outside. This past weekend was hectic here as there were so many Santa events going on I did not know where to start with them. Bless San Francisco. On Saturday was Santacon which is where everyone dresses as Santa – hits the bars and by the evening you have loads of drunken Santas’ all over the streets. It is a fundraising event where they try to collect as many toys as possible for the kids that need Christmas presents – the toys are dropped off at different locations so in one way it is serious but in another way it is fun. Last year our park was red with Santas’ but this year it was really quiet. I only saw three and managed to get a picture of Layla with them. On Sunday was the skivvy run which is a fundraiser for the AIDS Foundation. 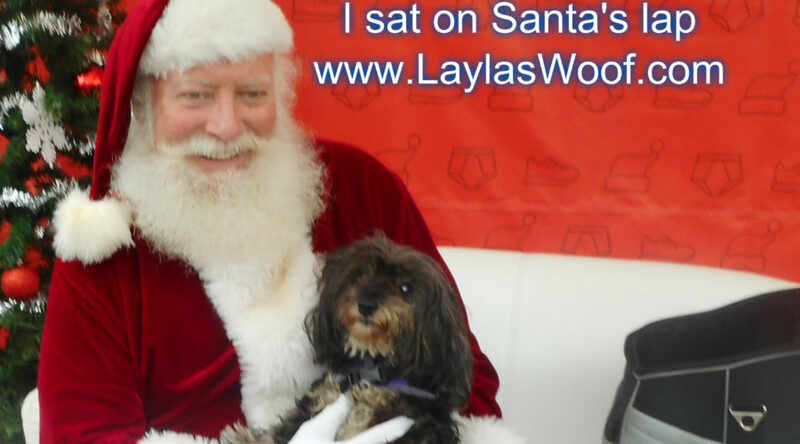 Layla and I went to check it out, it was lots of fun plus of course she got a picture with Santa Claus. Actually all the photographers there took pictures of her too. Not sure who they are but it is ok with me. I hope they managed to raise funds to help this wonderful organization. She also was spoiled by PAWS as they every year do a delivery of a goodie bag for our pets and she got one too with two new toys and some treats. All in all it was a crazy but fun weekend. I need to rest LOL. 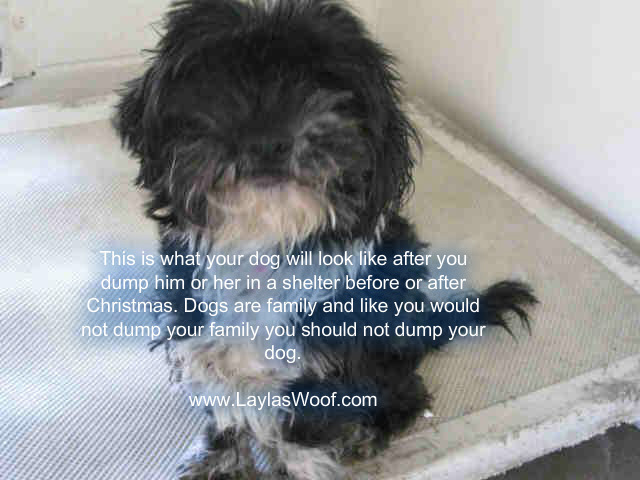 NOW we must also not forget that with Christmas coming the shelters fill up with irresponsible pet owners dumping their pets with ridiculously sad stories, it is a time for us to adopt a pet and not buy from a breeder. January becomes a nightmare for the over crowded shelters and rescuers work full time trying to save as many as possible. It is not a happy time but a really sad time. 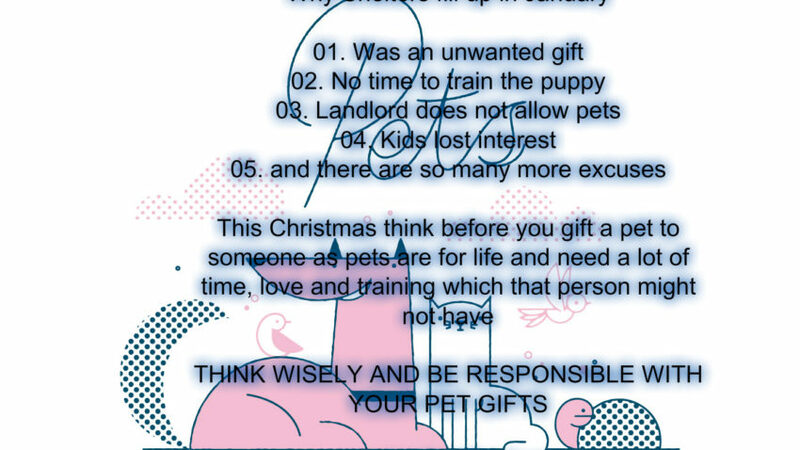 We must also remember that to give a pet as a gift to a kid is something to be thought about carefully as that pet should not pay the price of being dumped at a shelter when the excitement wears off. Please remember that. I rescued Layla in January 2011 and I often wonder if she was dumped there as the novelty of having a pet had worn off with the family that dumped her or what was the real reason. She is one of the lucky ones to have been rescued by me but there are so many that are not that lucky. I am off now to bed to dream about my lucky life with Mom and pray that many will be as lucky as I am. Woof from chilly San Francisco. Winter has arrived and it has been cold especially at nights so Mom has been tucking me in at nights with extra blankets and putting a t-shirt on for extra warmth. I do not like the rain but if you have to go you have to go so our walks have shortened a bit actually I make Mom walk in the rain and I wherever possible walk under the eaves of the buildings. When there is a lull in the rain then we go to the park for a bit like on Sunday which was pawsome as there was sun also but Mom explained those afternoons in the park are ending till spring arrives. I am not happy as I will not be seeing all my friends and especially won’t be seeing my treat uncles – grrrr. So please tell Mom that I need extra treats from her. 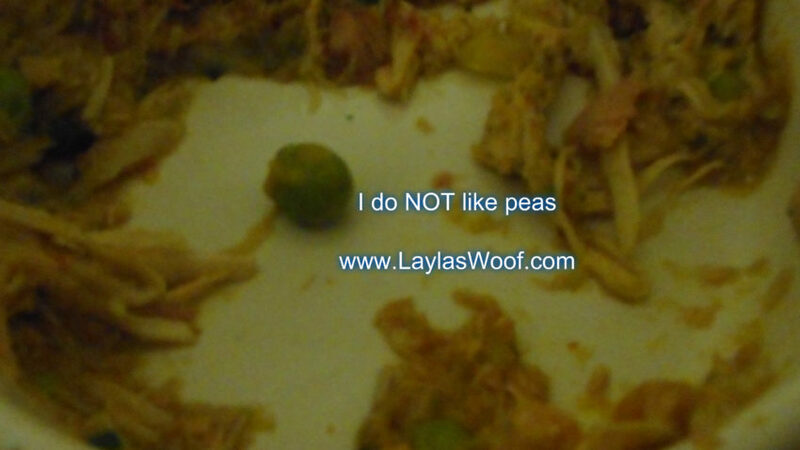 I always make sure I have a stock of sliced beef neck bones for Layla which keep her busy chewing on during the day. She gets one a day and is very happy. Another reason I do that is to cut down on all the treats as this has meat on so she is actually eating food which is better for her weight in the long run. The past month or so I have been experimenting with food for Layla as I want to take her off the Grandma Lucy and make everything from scratch at home. Excluding her supplements which I add to her food. Although Grandma Lucy has not had any recalls I am tired of seeing how many are happening and got to the point that if I live off home cooked food she is going to also. After a lot of trial and error, as Miss picky eater can be impossible, especially LOL if she sees chunks of veggies and Oy the peas are a big no, I made up a green smoothie for her with blanched vegetables (some that have to be cooked are) and when blending the veggies kept the vegetable stock with them. 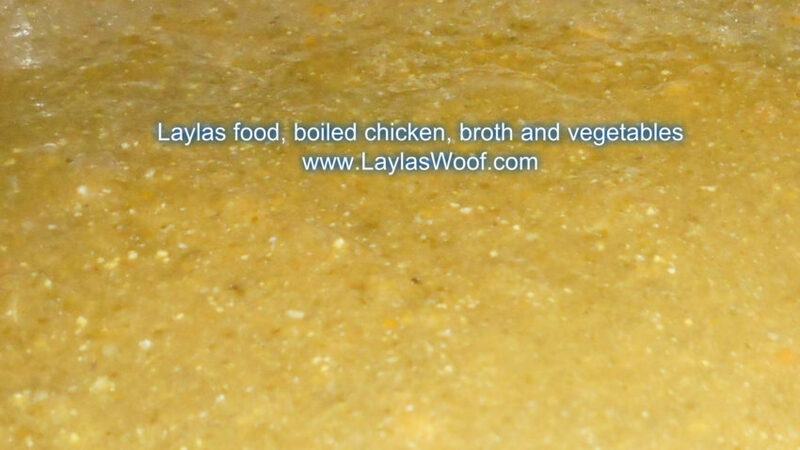 I add the smoothie to her chicken broth. It is working wonders and am really happy as her diet is so balanced and healthy and she is gobbling it up. What is her smoothie : Celery, spinach, asparagus, peas, green beans, pumpkin, carrots, kale, broccoli, brussel sprouts and zuchinni. I also added some blue berries and apples for the fruit. I made enough for at least two months and have frozen it in portions to make life easier. She does get green lipped mussels, coconut oil and other supplements in her food so personally I think it is very very balanced. I also put in her food is Rooibos Tea – or as they say in the US Redbush Tea – it is a South African tea that I grew up with, and was told it was good for pets, did some research and we now both are drinking it. Does anyone have any other suggestions – am open to all ideas. I love cooking, studied it and have a degree in Classical French cooking, it is therapy for me and a wonderful way to relax so doing this makes me really happy. I am also this winter going to be experimenting with different foods from different countries for me, when you stuck indoors in bad weather that for me is the solution LOL. 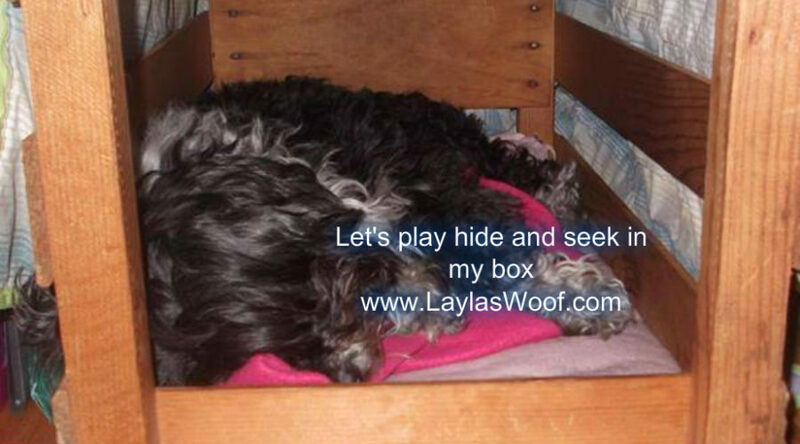 So on this cookery note Layla is sleeping of course in her box, and I am off to some meetings as someone in the family has to make money LOL. Mom has come to the conclusion that the next month is all about holidays, we just finished Thanksgiving and Hanukkah will be starting this weekend. What is Hanukkah – it is the festival of lights when a miracle happened and the oil that the Maccabees found to last for one night lasted eight nights so we celebrate this by lighting a candle every night and eat lots of oily foods. Very good for the diet and cholesterol LOL. What are these foods – Latkes which are like fried hash browns and are yumm, Donuts or what we call them Sufganiyot – in Israel they make them with the jelly in the middle and are delicious. I remember when living in Tel Aviv there was a bakery that made the best I have ever eaten and you had to order in advance to get them as if you went randomly there was a line around the corner waiting. Hmm those were the days. Chocolate Coins which we give to the kids and are called Hanukkah Geld. We also play a game with a dreidel – it is a four sided top with Hebrew Letters on and you win when it falls on one of the letters. 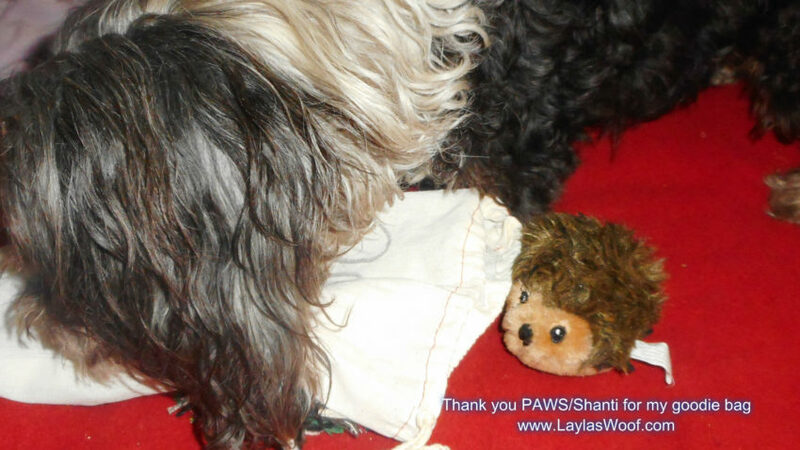 Another tradition for Hanukkah is we exchange gifts and Layla was lucky to get a wonderful gift from Purebites of different treats. 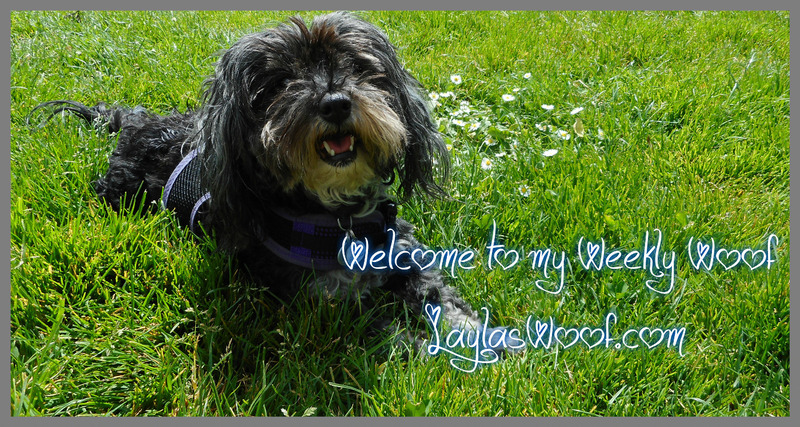 They are her favorite as they are freeze dried treats made with only 1 – 3 ingredients and I call them Layla’s crack LOL, the flavors she got are chicken breasts lamb liver and beef liver. PLUS I think for her the cherry on the cake was their Chicken & Sweet Potato Jerky, she is now set for the holidays with healthy treats made in the USA and I am so grateful for Purebites sending them to us as their treats is one of the few companies I really trust. 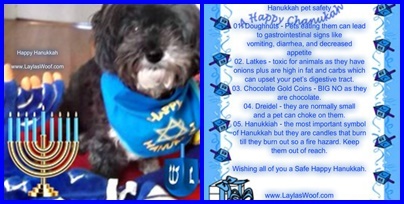 Mom says I cannot eat most of the Hanukkah foods but she will be making me my own doggy latkes and we are sharing the recipe here plus sharing with you the recipe for the Hooman ones for those that want to try. Mix all in a bowl, spoon on to a baking sheet which is covered with parchment paper, bake on 350 Deg till brown on top, flip over and carry on baking till ready (golden brown) Cool and serve it to them with sour cream or cottage cheese. This recipe makes about 5 or 6 depending on the size of the sweet potato. NOW to make life easier and tastier instead of crying while grating onions I use a packet of Lipton Onion Soup mix. Squeeze all the water out of the potatoes, add the rest of the ingredients and mix together. Heat up oil in a frying pan, I use Canola oil, drop a table spoon of the mixture into the hot oil, flattening them a bit, fry till golden brown on each side, drain on a paper towel. Serve hot with either sour cream or apple sauce. Bon Appetit. 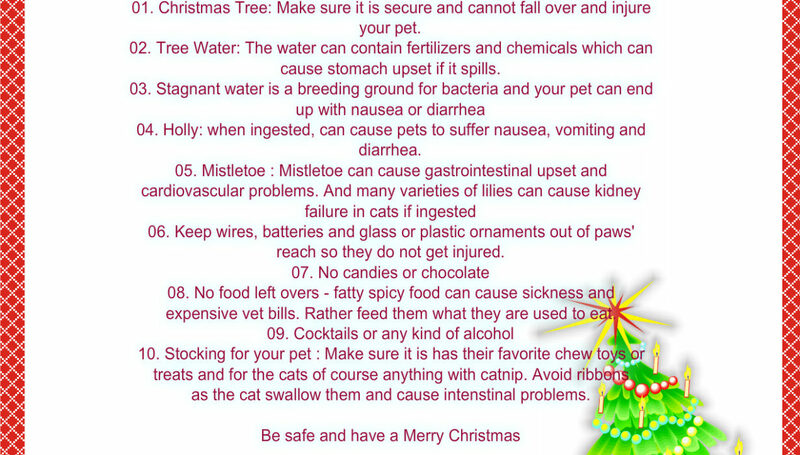 Please make sure you keep your pets safe during Hanukkah. 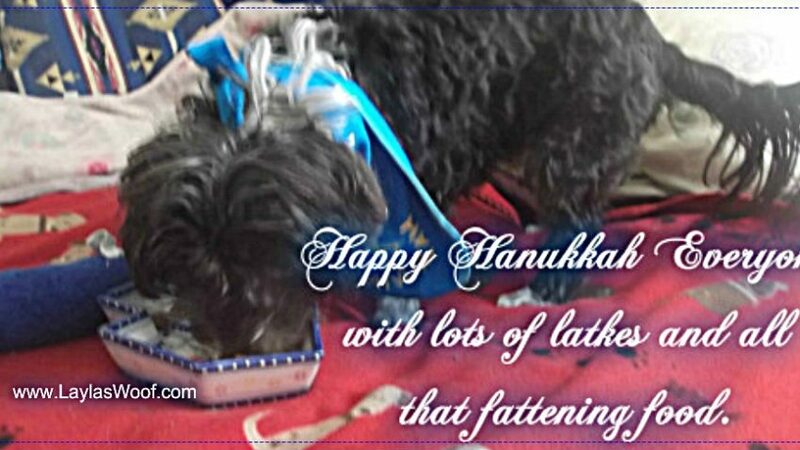 Now I am going to hibernate as it is cold and raining, to all those that celebrate Hanukkah – Hanukkah Sameach, have a wonderful holiday and do not over eat.